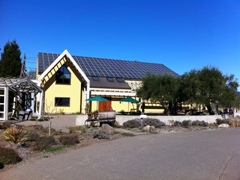 Quivira's Dry Creek Valley tasting room is set in one of their biodynamic vineyards, and complete with solar panels. This family-owned winery has a lovely tasting room in a tranquil setting just outside Healdsburg in Sonoma County’s Dry Creek Valley. 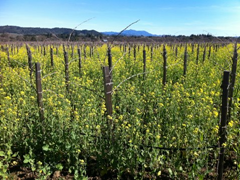 Their hand-crafted, estate-grown wine is made from organic grapes and the tasting room is set in the middle of one of their biodynamic vineyards. 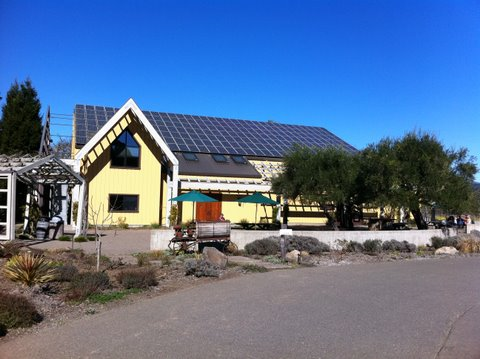 There are solar panels on the roof, and a garden with farm animals greet you in the tasting room parking lot. 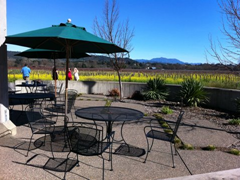 There is a partially shaded picnic area with plenty of tables where you can take advantage of the sweeping views of Dry Creek Valley while you enjoy your lunch over a freshly purchased bottle of wine. The $5 tasting fee is waived with purchase, and with this coupon you receive a free tasting when you pay for one. 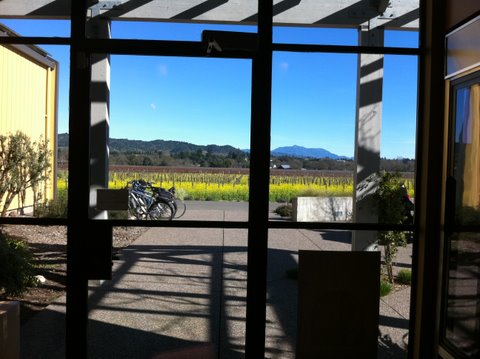 Large glass doors let you enjoy beautiful views out over Dry Creek Valley while you sample the wine at Quivira's tasting room. 2009 Fig Tree Vineyard Sauvignon Blanc, $18 – This easy to drink white wine was a great start to our wine tasting at Quivira. It’s fermented only in steel and has its lovely clean, citrus gives way to an easy finish. 2008 Dry Creek Zinfandel, $20 - Made with grapes drawn from several different Dry Creek Valley vineyards. We really wanted to like this wine. We’re huge Zinfandel fans, and Dry Creek Valley produces some really excellent wines, but this just wasn’t one of them for us. It’s much lighter than we were hoping for from a Zinfandel, without all the fruit we were looking for. The finish has quite a bite to it too – too much pepper for our taste. 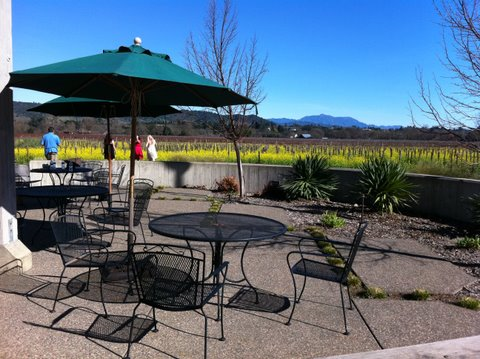 The large patio at Quivira's Dry Creek Valley tasting room has plenty of seating for a wine accompanied picnic. 2008 Wine Creek Ranch Grenache, $26– Dry Creek Valley is an area famous for its Zinfandel; so it was a refreshing change to sample this unusual red wine varietal. It was nice and light with just a touch of pepper and a clean finish. 2008 Wine Creek Ranch Mourvedre, $32 – Another unusual varietal to find in Dry Creek Valley. With it’s blackberry and hint of spice this was our favorite of all the wine we tasted at Quivira. 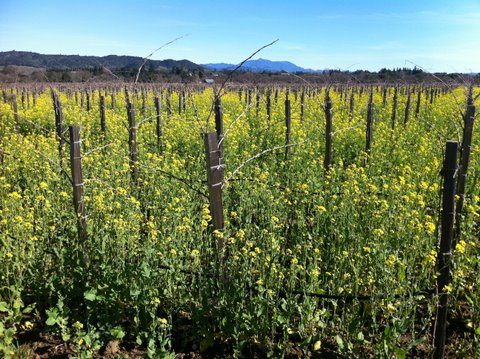 Spring brings wild mustard with its vibrant yellow to the vineyard surrounding Quivira's tasting room in Sonoma County's Dry Creek Valley. 2007 Hommage a Ampuis Syrah – We really enjoyed this big, bold Syrah which is fermented on Viognier skins. More complex than many Syrahs, it was a great way to toast our wine tasting at Quivira!